Todd Roland Worrell (born September 28, 1959) is a retired professional baseball relief pitcher. He played all or part of eleven seasons in Major League Baseball for the St. Louis Cardinals and Los Angeles Dodgers between 1985 and 1997. During his playing career, Worrall was a three-time National League All-Star. 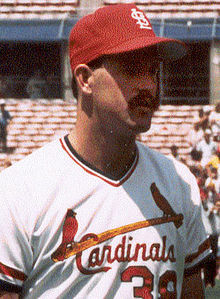 Worrell was drafted by the St. Louis Cardinals in the 1st round of the 1982 MLB draft out of Biola University. He made his MLB debut on August 28, 1985, pitching 1 2/3 scoreless innings in relief against the Cincinnati Reds. He picked up his first save on September 13 against the Chicago Cubs. Worrell saved five games down the stretch and compiled an earned run average of 2.91, then pitched effectively in the postseason against the Los Angeles Dodgers in the NLCS and the Kansas City Royals in the 1985 World Series. Worrell was the losing pitcher of Game 6 in the latter series, as a blown call by umpire Don Denkinger set up a rally by the Royals and allowed them to win the game in the bottom of the ninth. Worrell was still eligible as a rookie in 1986, and his 9-10 record with 36 saves netted him that year's National League Rookie of the Year Award, as well as the National League Rolaids Relief Man Award. He was on the mound when the winning run in Game 7 of the 1987 World Series scored, though he was not tagged with the loss as the runner who scored it had been inherited from another pitcher. Worrell became the first relief pitcher to save 30 or more games in each of his first three full seasons. On September 4, 1989, Worrell was pitching for his 125th career save, which would have tied him with Bruce Sutter for the Cardinals' career record. While making a pitch, he felt a ligament snap. He underwent elbow surgery in December to repair the damage, then experienced shoulder pain when attempting to come back for the 1991 season and was diagnosed with a rotator cuff tear. As a result, he missed both the 1990 and 1991 seasons due to injuries and rehabilitation. Worrell came back in 1992 as a set-up man for veteran Lee Smith. Worrell signed as a free agent with the Los Angeles Dodgers on December 9, 1992, where he struggled for two seasons before regaining his old form and saving 32, 44, and 35 games in the final three seasons of his career, making two of his three career All-Star appearances and becoming the Dodgers career saves leader. He retired following the 1997 season. Todd is also the older brother of Tim Worrell, himself a major league pitcher between 1993 and 2006, and also a distant relative of American swimmer Michael Worrell. Both attended Biola University. Todd currently owns and operates Firesteel Creek Hunting Lodge north of Plankinton, South Dakota. He has three sons, Josh, Jeremy and Jacob who have all played baseball. Josh played at Indiana Wesleyan University in Marion, Indiana and was drafted in the 30th round of the 2009 MLB draft by the Kansas City Royals. He played three seasons in the low minors. Jeremy and Jacob also played at Indiana Wesleyan University. Todd is currently the pitching coach at Westminster Christian Academy in St. Louis and also coaches for the River City Rascals of the Frontier League. ^ Gordon Edes (March 18, 1992). "Worrell's '80-year-old Hand' Now Throwing 95-mph Fastballs". Orlando Sun Sentinel. ^ Jason Reid (December 5, 1997). "Worrell Closes Door on Career". LA Times. ^ "Firesteel Creek Hunting Lodge website". Archived from the original on 2014-06-01. ^ "Josh Worrell minor league statistics". ^ "Jeremy Worrell profiles at IWU Wildcats". ^ "Jacob Worrell profile at IWU Wildcats". ^ "Todd Worrell joins the River City Rascals". Archived from the original on 2014-06-01.